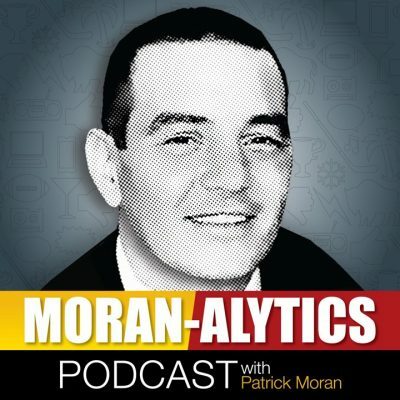 On this episode of the future award-winning Moran-Alytics Podcast, Patrick Moran scores an interview with one of the most versatile and talented members of the national sports media. Sports Illustrated senior writer, podcast co-host and star of The Wilder Project Charlotte Wilder joins for a wide-ranging interview. The two talk about Wilder growing up near Boston the daughter of an accomplished writer, setting a desire early in Charlotte’s life to follow in her mother’s career path. She explains (rather humorously) why she ended up at Colby College and how the experiences of writing for several publications helped prepare her for the opportunity that would come at Sports Illustrated. While the interview is generally lighthearted Moran asks Wilder about an enlightening post she penned for Boston.com in 2015, where she revealed she’d been dealing with anxiety since sixth grade. Wilder provides outstanding perspective on mental health. Charlotte also discusses her Most Valuable Podcast she co-hosts with Jessica Smetana and The Wilder Project for SI TV. She reveals that a new season is coming soon while discussing past guests, including PFT and Big Cat from Pardon My Take. They finish with the traditional Moran-Alytics Podcast “Mini Lightning Round” and Charlotte reveals among several things her favorite city to visit, athlete to cover, Twitter follow and three guests she’d most enjoy having for dinner. You can follow Charlotte Wilder on Twitter at @TheWilderThings and check out all her work at SI.com. After the interview Moran has takes on Sunday night’s Grammy’s show, including Alicia Keys as host, Cardi B. winning Best Rap Album and being blown away by a Brandi Carlile breakthrough performance. Recurring guest Aaron Quinn (@AaronQuinn716) of Cover 1 then joins for another segment, where the two talk about Kareem Hunt signing with the Browns as well as a tweet from Benjamin Allbright that suggested the Bills had interest in the troubled running back and what it may mean for Lesean McCoy’s future. They also discuss some mock drafts out there that have Buffalo tacking an offensive tackle in the Top 10 plus the Moran-Alytics Interest Meter, where Quinn scores and offers a tak a bunch of topics, including Phil Mickelson, Anthony Davis and AEW.